UC San Diego Health has a 4-year plan to expand its primary care and walk-in services. On Monday, October 15, UC San Diego Health will open a new comprehensive health center located at 16950 Via Tazon in Rancho Bernardo. Described as a “clinic of the future,” the new 57,000 square foot facility will offer patients increased access to a team of top doctors and nurses, and an array of convenient services, such as urgent care and advanced imaging, including a pharmacy and optical boutique. UC San Diego Health – Rancho Bernardo is designed around the needs of the patient, offering integrated services, such as primary care, women’s health, occupational medicine, and behavioral health. Additional services include urgent care, blood draws, imaging, and pharmacy. Beginning in January 2019, a team of university specialists will be available to see patients at UC San Diego Health – Rancho Bernardo who are in need of cardiac, orthopedic, neurologic, gastroenterological, dermatologic, and ear, nose and throat expertise. Whether patients see providers in Rancho Bernardo, or at any of its clinics or hospitals, all care is coordinated through one medical record to assure highly-coordinated safe care. UC San Diego Health is unique among local health care providers in that it is a nationally-recognized academic medical center. These specialized health systems offer multidisciplinary teams of experts who have access to medical and surgical resources not offered in other settings or networks. Many of the doctors of UC San Diego Health are also researchers at UC San Diego School of Medicine and Moores Cancer Center, where they are developing the newest diagnostic criteria, therapies and treatments for the most challenging patient conditions. 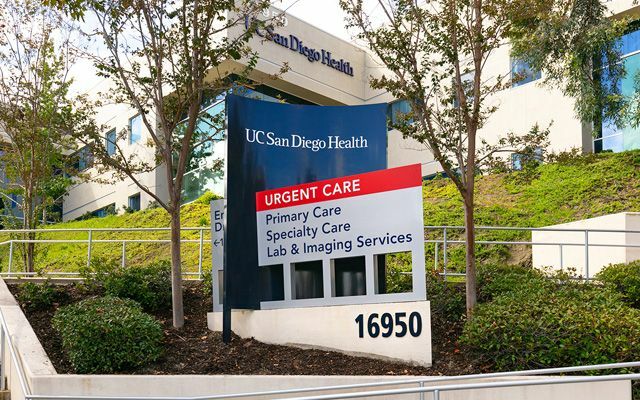 As part of its plan to increase access to providers, UC San Diego Health will open more than 10 express and primary care sites over the next four years. New locations will be offered throughout the community along public transportation lines. New locations will open in: Encinitas, La Jolla, East Lake, Carlsbad, and Poway. UC San Diego Health, the region’s only academic health system, is dedicated to delivering outstanding patient care through commitment to community, groundbreaking research and inspired teaching. Its specialty care for serious and complex conditions is consistently ranked among the nation’s best by U.S. News & World Report and other organizations. The 808-bed academic health system includes UC San Diego Medical Center in Hillcrest and Jacobs Medical Center, Sulpizio Cardiovascular Center, Moores Cancer Center, Shiley Eye Institute, Koman Family Outpatient Pavilion and Altman Clinical and Translational Research Institute, all in La Jolla.